What EMV chip card terminals can be used with Microsoft Dynamics AX Retail POS? We support Verifone MX 915, Ingenico ISC250 multilane terminals and the Ingenico ICMP mobile terminal and have a variety of certifications so that you can process EMV chip transactions today with all the major US processors, including First Data, Chase Paymentech, Tsys, Vantiv, Moneris and others. 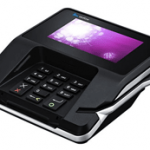 Verifone MX915 EMV chip card accepted terminal. Does POS solution support EMV chip with pin debit? Does POS solution support EMV chip with pin credit? Can customers bypass chip and just use mag swipe? Can customers bypass entering pin? Does EMV certification include partial authorization? If not, what happens when account doesn’t have enough for transaction? Are terminals injected with P2P encryption? Do you have mobile EMV with chip and pin? If business to business, does the EMV certification include level 3 processing? Are all of the above working right now in a live environment, or are there still bugs to be worked out? If any answers are no, merchants need to understand the impact before choosing a solution. How will the gateway help with my other sales channels? How will the solution reduce PCI Compliance burden? “My clients have been processing EMV chip transactions with multilane terminals successfully since January 2015. It’s dizzying even for me to keep up with what which terminals are certified for which solutions. Since that information changes constantly, it’s best to call for a consultation to assess short and long term needs to achieve the best outcome while minimizing business disruption,” Christine Speedy. Is it integrated to Retail Hero? No, that’s a separate integration that Retail Realm would need to do since the product is exclusive to them. How much do terminals cost? It depends on the terminal. They’re reasonably priced. Please be aware, merchants must acquire terminals only through us or our approved distributor to ensure security and reliability of EMV and payment ecosystem. You cannot bring your own device. How much does it cost? The Dynamics AX ERP and POS payment module is included free with purchase of our payment gateway services, which are very reasonably priced. Where can I buy the Dynamics Ax POS EMV payments module? Contact us. Can I use with my merchant account? Yes. This entry was posted in EMV, Equipment-POS, ERP and tagged Microsoft Dynamics AX, POS, pos equipment by Christine Speedy. Bookmark the permalink.